I think you can agree when I say that everyone loves the holidays but NO ONE loves holiday shopping. The lines, the crowds, the stress - it all makes picking out that perfect gift for the ones you love so unappealing. 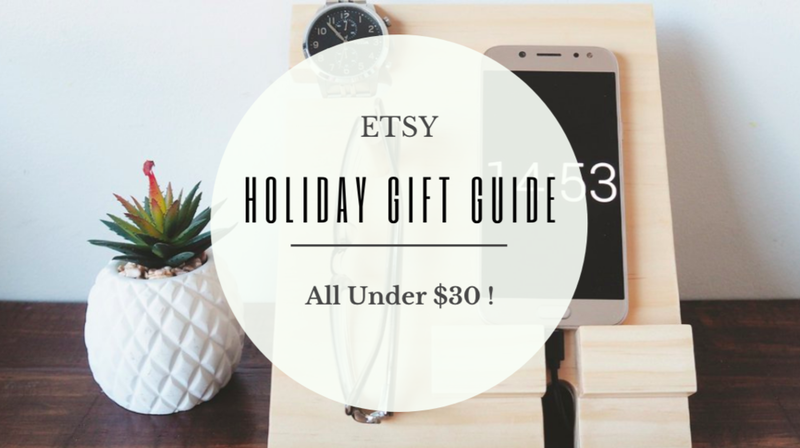 This year I have curated a gift guide from one of my favorite sites, ETSY, to make shopping for presents effortless and easy - regardless of your budget . Sit down with a glass of wine , throw a few of these items into your shopping cart and you will never go back to fighting for a parking spot at a crowded mall ever again. This classic decanter is perfect for dinner parties and to display in their home long after the holidays have passed. Everyone loves a minimal-aesthetic-queen am I right? How cute is this cutting & serving board?! Your host will love using it to serve appetizers & prep meals. And an added bonus… you can use it when casually posting food pics on Instagram to prove how insanely domestic you have become since you gave up instant noodles in college #Adulting . When I bought my first salt cellar, Dean looked at me like I was crazy. He couldn’t understand why I needed a fancy container for my already pretentious Himalayan Pink Salt; especially when it already came in a shaker. He will never admit it , but swear I caught him in the kitchen, pretending to be ‘Salt Bae’, sprinkling the very salt he once mocked. This gift is perfect for the host who loves to cook … and ALSO the perfect hint to the host who notoriously under-seasons his/her meals… you’re welcome. The only thing better than traveling to a new place, is getting back and adding another pin on my travel map. If you watched my Refinery29 Sweet Digs Studio Tour , you would have seen our map in all of its glory. Gift this to the person in your life who basically lives out of a suitcase to help them keep track of where they have been & dream of everywhere they can go. Any seasoned traveler knows that rule #1 is : always have a reusable water bottle handy. This double walled tea infuser bottle with bamboo lid is perfect to brew tea in the colder climates or hydrate on the go during those busy travel days. If they are feeling exxxxtraaaa fancy , they can also add fruit into the infuser. Yaaaas! Everyone knows at least one person who either always forgets to pack their chargers or refuses to pack them neatly which results in a frustrating, tangled mess. This leather cable organizer can be customized and is a must-have for anyone who travels often. Gift them with one of these and they will have no excuse to continue with the madness. Does a man in your life always lose his keys ? Does his phone always seem to mysteriously disappear into the couch or behind the bed? Can he never find his reading glasses or his favorite watch? This docking station will not only display his essentials in a sleek, modern way - I guarantee you will hear “ Baaaabe …. have you seen myyyy [insert missing item here] ” a whole lot less. In my opinion - THAT is worth $27 !!! This gift is perfect for your dad, your brother, the man in your life… basically anyone who you would like to trick… i mean CONVINCE to BBQ this holiday season. He’s sure to love this $15 personalized tool set ( for $30.99 you can also get the great case! ) and you are SURE to love whatever he ends up making. Pro Tip: If he doesn’t know how to season the meat well, refer back to the salt cellar gift above and make sure to give that to someone else in the household. Now that is a what I call a win-win my friends. While i’m lucky to have a family that I love to be around, i’m not naive to the fact that some families around the holidays can be a lot to handle. Help him out this year by giving him a sleek, matte black personalized flask set that will help ease the stress when he needs it most. If you’re nice - he may even share !!! I scoured Etsy to find a candle that not only had phenomenal reviews, great packaging but also was sold at a great price. This Lavender Soy Candle by Gold & Ivy is IT! Lavender aromatherapy is known to help relieve insomnia, anxiety, depression, and headaches. Snag a couple and pass them out to the women in your life who work hard and need a little pampering this December . As someone who is a super fan of Rae Dunn, it is no surprise that a ceramic, organic shaped mug has made the list for a great gift this year. There is something about drinking my morning coffee out of a handmade mug that makes me feel like i’m doing the most ( in the best way possible). Gift it by itself or with your favorite hot chocolate mix and you have an affordable gift she will surely enjoy this winter . I know we have all seen ( and fell in love with ) these Scandinavian , luxurious, chunky knit blankets. With a wide range of colors and dimensions to choose from you may even end up buying one for yourself.